Yes, we've got a policy for that! As a member of METRO, the Metropolitan New York Library Council, the City College Libraries can refer patrons with special research needs to other METRO participants. Our policies are governed by the regulations established by METRO, which can be found in the METRO Directory, available at any City College library reference desk. Use the Yellow Card when the title that you need is not available through either the CUNY library system or the New York Public Library system. 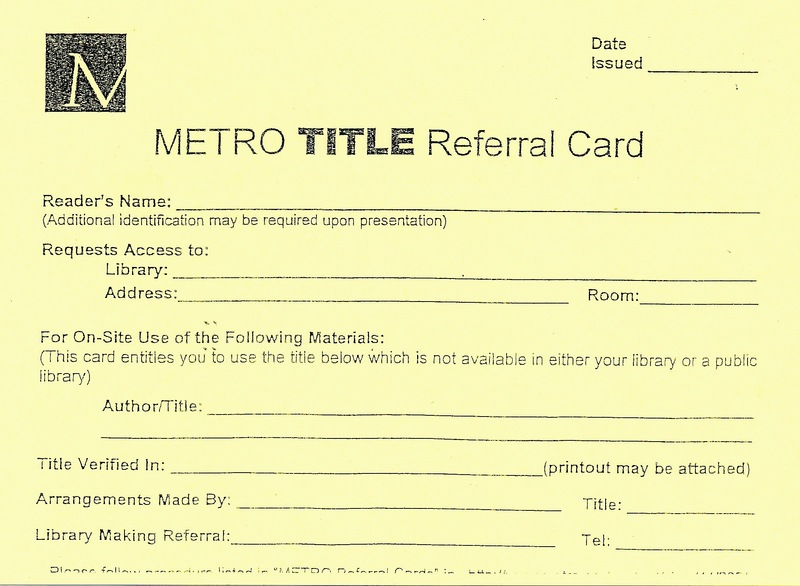 The Yellow Card is intended for referrals to specific titles in METRO member library collections. It cannot be issued for general use in another library. 1. Verify that the title is not available in the CUNY libraries or in the New York Public Library. 2. Determine whether the title is available in a participating library. 3. Check the library's listing in the METRO Directory of Members for access restrictions. 4. Phone the host library to verify ownership and ascertain any additional restrictions. 5. Fill out the card. 1. Access to another library does not guarantee that materials will be available at a particular time. It may be possible to make special arrangements to hold materials when the situation warrants (e.g., for persons with physical disabilities). Inform the issuing librarian of any special needs when you request the card. Such arrangements (when possible) will be noted on the back of the card. 2. The METRO card does not allow borrowing books or using materials not listed on the card. 3. The length of time that the reader may use the facility is determined by the host library. The Blue Card is for access to materials in a specific subject area. This is a reciprocal service through which member libraries extend access to patrons of other libraries participating in the program. Use the Blue Card when you need access to another library's collection for research in a specific subject for a limited and fixed period of time. Like the Yellow Card, the resources needed must not be available in either the CUNY libraries or the New York Public Library. 1. Verify that the library that you want to visit is strong in the specific subject area. 2. 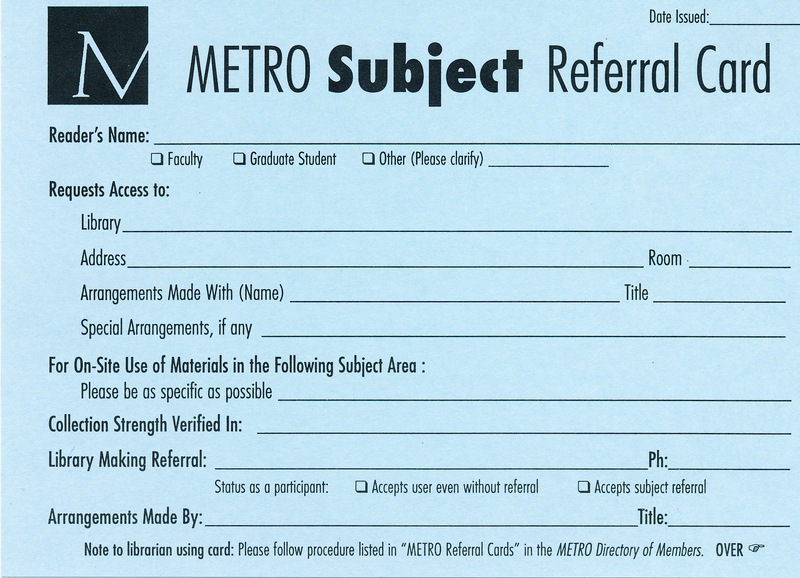 Check in the METRO Directory of Members to ensure that the library is a Blue Card project participant. 3. Phone the host library to ascertain any restrictions such as length of time, or hours and days on your use of their facility. 1. Access to another library does not guarantee that materials will be available at a particular time. 2. The METRO card does not allow borrowing books or using materials other than those on the subject listed on the card. 3. The length of time and any other use restrictions on using the facility are determined by the host library. 4. Reference help may not be available.